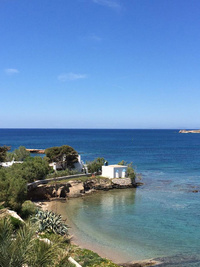 Paros Roms Dora offer accommodation in Parikia, the capital of the island. The area of the rooms is called “Germanika”: it is a quiet, seaside neighborhood very close to the old town and the port of Paros. Staying here, you don't need a vehicle, you can reach the beach, the nightlife, the bus stop and the Market at a few minutes' walk. • nightlife, restaurants & cafes: 400m. • Bus stop with routes various beaches of Paros: Souvlia (850m. ), Parasporos (1.5km), Agia Irini (4km); also to the port of Pounda (5km.) with kite surfing schools and boats to Antiparos, the fishing village of Aliki (8km), to the port and airport of Paros.